An interesting development in the world of advertising. One suspects a whole raft of local regulations and planning changes will follow or curtail this. However for lovers of Blade Runner this is to be welcomed...as long as it comes with cars that fly! Passers-by on a London street were recently amazed to see a fleeting image of a pink tongue protruding from fruitily plump lips, seemingly suspended in mid-air. It was the famous logo for the Rolling Stones and was part of an experiment by tech start-up Lightvert. 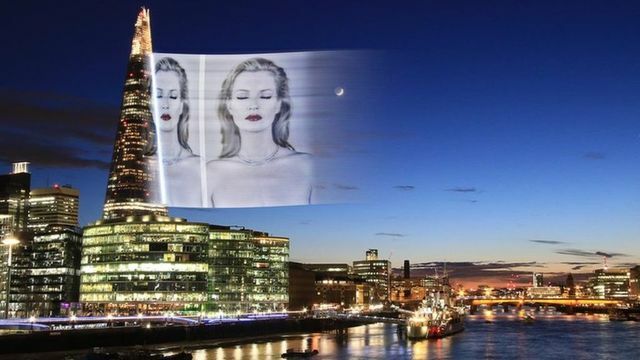 Its technology can produce images that appear to be 200m (656ft) high, but which only exist in the eye of the viewer for a fraction of a second.